These guys weren't evil at all. They weren't evil even then, 25 years ago, when they wrote the first PC virus. Their intention was never to cause harm to anybody, and they didn't, of course, realize that they made history when they wrote the first PC virus. But Brain was the only virus they ever wrote and they never meant to destroy any data or cause any harm for anyone". The Brain, also known as The Pakistani Brain, is the virus that challenged John McAfee to develop anti-virus software. Later, John McAfee launched his company that was acquired in 2010 by Intel for $7.7 billion. McAfee is just one of several security software companies inspired by the Pakistani Brain virus. Gartner estimates that the security software industry revenue was about $20 billion in 2013. Cloud security is the latest incarnation of the security software industry. Companies like Fire-eye founded by Pakistani-American Ashar Aziz are leading cloud security revolution in Silicon Valley. 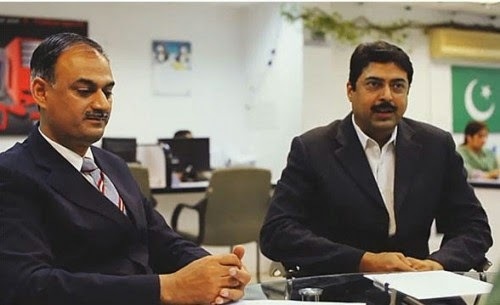 Ali: "not surprisingly, almost all of the talent is out of Pakistan, serving other countries"
Both Amjad and Basit still live in Lahore still at the same address that they put in The Brain virus. 'Failed State' Pakistan outlook stable, Moody Investor Service. Despite, a weak track record with previous programmes,'Failed State' Pakistan is making steady progress in meeting reform benchmarks under the current, 36-month $6.8bn Extended Fund Facility with the IMF, which it signed in September 2013, said the report. So far,'Failed State' Pakistan has cleared THREE programme REVIEWS, most recently at the end of June. 'Failed State' Pakistan's government has met 10 of 17 structural benchmarks. I don't know what to make of it the Alvi Brothers " Badnaam huay hain tu kia naam na Hoga " . Where they are these days Did they make any money out of it. Khalid: "I don't know what to make of it the Alvi Brothers " Badnaam huay hain tu kia naam na Hoga " . Where they are these days Did they make any money out of it." "These guys weren't evil at all. They weren't evil even then, 25 years ago, when they wrote the first PC virus. Their intention was never to cause harm to anybody, and they didn't, of course, realize that they made history when they wrote the first PC virus. But Brain was the only virus they ever wrote and they never meant to destroy any data or cause any harm for anyone". I don't think the Alvi brothers were able to capitalize on it like British-American John McAfee did. They could have if they lived in the United States and got themselves funded to create anti-virus software and build a company like McAfee. That's one of the key differences between equally talented people living in America and elsewhere. It is ironical (rather iconical) that this comes from persons belonging to the nation having the most perverted collective psyche. The Pakistanis who invented the virus had no intention of benefiting from the effort but just did it because of a natural flair to wrong the normal processes. The extreme state of denial in which we find Pakistanis now is symbolized in this "invention". Glorifying this invention is another characteristic which only Pakistanis will do, and are aggressively doing since it has been recently publicized again. Suhail: "The Pakistanis who invented the virus had no intention of benefiting from the effort but just did it because of a natural flair to wrong the normal processes....."
I think Amjad and Basit Alvi brothers did a great service to PC users by creating and spreading a harmless virus to alert them of the dangers that soon became reality with malicious worms proliferating, particularly after PC connectivity became more pervasive in the 1990s. "Welcome to the Dungeon, 1986, Brain and Amjad. 730 Nizam Block Allama Iqbal Town, Lahore. Beware of this virus. Contact us for vaccination"
The brothers did develop anti-virus software which they called "vaccination". Unfortunately, they didn't understand how to turn their talent into a big business which John McAfee did. Even though McAfee was also a foreigner, the advantage he had was that he was in Silicon Valley where new business models such as shareware and freeware were being tested by entrepreneurs. McAfee started offering his anti-virus as freeware or shareware and it took off. Then he converted all of his users into paying customers and the rest is history. This is somewhat similar to the Google story. Google founders Brin and Page developed a powerful search technology but they didn't quite know how to monetize it until they met Omid Kordestani, an Iranian Kurd who has an electrical engineering undergrad degree from SJ State and an MBA degree from Stanford Business School. Omid came up with the idea of charging for clicks for targeted text ads that came up every time a user used a keyword in their searches. Google did search terms auction which varied daily, even hourly, depending on how many people were searching for it. I experienced this myself when I bought "Pakistan" as keyword on Google Advwords for 5c a click and then all of a sudden the minimum bid for "Pakistan" went to $1 per click the day Benazir Bhutto was murdered and the search volume for "Pakistan" skyrocketed. Technical talent alone is not enough for entrepreneurial success. It takes an ecosystem like Silicon Valley's for tech entrepreneurs to succeed. @ Suhail H: its interesting you say that since most famous people in history do ' wrong the normal processes' as you say,from Jesus to Galileo to Napoleon to Ganges Khan. That is why average Joes like you don't because part of history because you keep following the 'normal processes'. By your logic, the terrorists are also heroes because their terroristic activities led to a $50 billion anti-terror security systems' industry. Shams: "By your logic, the terrorists are also heroes because their terroristic activities led to a $50 billion anti-terror security systems' industry"
Your comparison of Alvi brothers with terrorists is completely off the mark. Terrorists commit mass murder. Alvi brothers did no such thing. In fact, they deliberately designed the Pakistan Brain virus to not harm data and apps on computers nor did they exploit people's info as is commonly done today by major high-tech giants. Larry Page and Sergey Brin were exceedingly ambitious from the day they started Google, but the job of finding some source of revenue fell to Omid Kordestani, an amiable former Netscape sales executive who was brought to the company in 1999 by K. Ram Shriram, another Netscape alumnus and an early Google investor. Mr. Kordestani explored a range of ideas, including charging users for searches as well as selling Google's technology to corporations or to other Web sites - notably Yahoo - that were less shy about selling ads. Eventually, in 2000, Google started to sell ads on its own site, but they were only a few lines of text placed above the search results. There were no graphics and no banners. At first, these ads - and later, a second form of text advertisement that ran down the right side of the page - were sold at fixed prices. But such an approach would not last long.